Whilst many avid viewers of the BBC comedy show Mock the Week have criticised the material that Frankie Boyle uses in his latest DVD, it is still worth a watch. 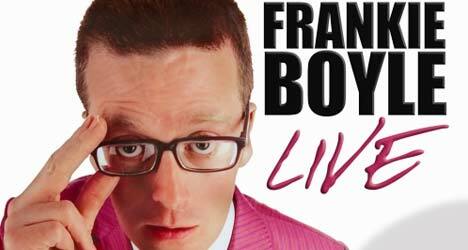 It doesn’t really help that much of the material has also been seen on Live at the Apollo too, so some of the jokes may be familiar to Frankie Boyle fans. In true Frankie Boyle style, many of the jokes are ‘close to the ‘edge’ and it is certainly not one to watch with your grandparents – not unless they are pretty open-minded! The DVD is recorded live at the Hackney Empire in London and the audience certainly have their voice heard as there’s plenty of heckling – at times invited and at other times not, but as you can imagine, Frankie soon puts them in their place. The elderly, teenagers, cats and the disabled are under fire as usual and as per usual, Frankie sails close to the wind. One joke to a poor lady near the front, who was unfortunate enough to be sat next to her very skinny boyfriend, certainly wasn’t laughing at his comment about the couple, but you’d have to watch it to cringe at that one. Put it this way: remember the Too Hot For TV Mock the Week with the Princess Diana joke? The reaction was similar! Even if you have watched Mock the Week and Live at the Apollo, the extras alone are worth the money for any Frankie Boyle fan. Just be careful who you watch it with.